Featured Music, Etc. : “Secret Samurai” by 2 Ft. 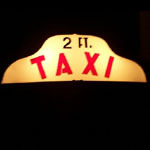 Taxi, “To Be With You” by Pete Robertson and “Ugly Woman” by Entity (a former incarnation of Rivertown. Did You Bring Enough Brass Instruments For The Entire Class? RamRozi brings in some podsafe comedy by Tekniknal Diffikulties. The dripping faucet takes its toll on Marcus. Check out the new Frappr Map and sign up to get on it with us.